Isn't it just amazing to think that God actually designed us and our children to compliment each other and work together and love each other? Sometimes it doesn't feel like it, that's for sure! When one child is constantly pushing our buttons and soon another child joins in, it can be pretty hard to believe that we were designed and created to handle this. Not on our own, of course - but with God's help. Instead of embracing this belief, our (i.e. my) mental processes run more down the lines of moaning, groaning and thoughts of "This isn't what I signed up for." I think it's too easy to forget that we're made in God's image, created with purpose and placed here with a calling to fulfill. And that's for every single one of us! Amazing, right? But it's super easy to lose sight of that in the day-to-day minutia of whining, hot tempers, fatigue, empty stomachs and other symptoms that tend to side track us. On intense days it's especially encouraging to think on the fact that God did, in fact, believe us capable of parenting these rather energetic small people of His! Here's the thing: when we start a family, many of us so-called "modern" parents probably did so with thought and care. We wanted to make sure we were going to be able to manage this, right? And yet, all of our efforts to plan our families according to our best interests are so feeble. We see and plan only for our foreseeable present and future. We don't plan our families according to the losses we might possibly sustain in ten years from now or the extreme fatigue we might suffer for an entire six months followed by an operation and then a lengthy recovery and a difficult financial time somewhere down the road. We don't plan our families according to the astounding career change that could suddenly and unexpectedly drop in our lap or the immense size of our retirement home and its ability to house numerous children and grandchildren. Of course we can't see into the future and predict these things. Oh we can and we do try but the truth is we haven't the faintest idea what the future holds. The same is true too for our emotional well-being. 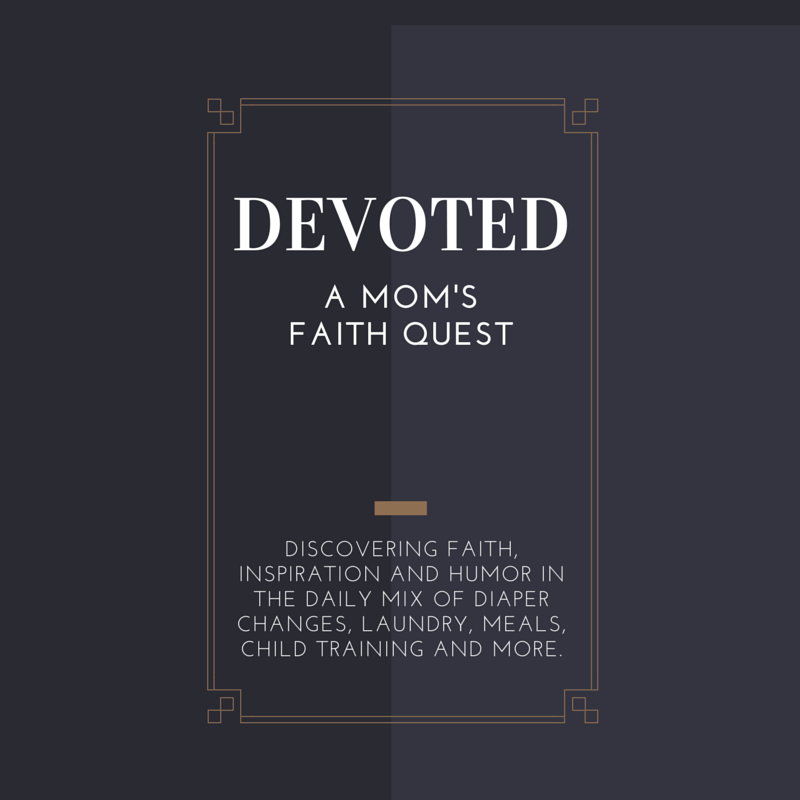 I venture to guess that most of us plan our families according to our current interests, abilities, health, and personal desires. We don't often take into account the possibility of debilitating cancer or a complete change in personal goals or ambitions, simply because we cannot foresee these things. We also do not plan our families around the likelihood of gaining character; for example, we don't say "I'll have another child because I know he or she will teach me to be so much more patient, understanding and accepting." The reality is that any one of these and thousands of other possibilities could happen to each of us. And yet we can't really predict any of it with much accuracy. We can only speculate, imagine, dream and pray. 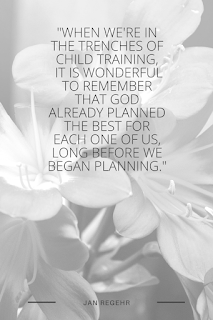 He planned to give us a family, a child or children, who would bless us and we them. Truly it is such a comfort to know that God sees and knows all - the past, present and future, the hearts, desires and intentions of each soul - and then with utmost care and skill He fashions a master plan for us. 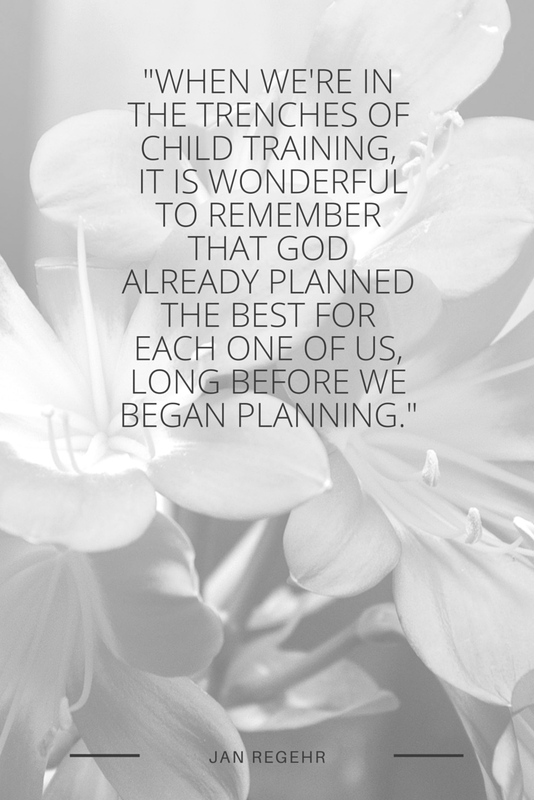 And then, how wonderful it is to know that not only has He planned this all for me but this plan lead Him to bless me with my dear husband and these precious children! I am so grateful today! And when I'm tempted to think thoughts of "this isn't what I signed up for", I'll remember God signed me up for something a whole lot better than I can even imagine.